The quality of data generated from a ChIP experiment is only as good as the quality of the antibody used in the ChIP experiment. 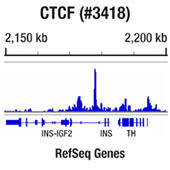 CST has an extensive antibody validation process for both ChIP-qPCR and ChIP-seq. Click below to learn more about our validation methods and standards for both ChIP-qPCR and ChIP-seq.